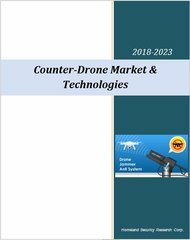 The Global Counter-Drone Market is Forecast to Grow at a 2018-2023 CAGR of 37.2%. The potential threat posed by an inexpensive drone carrying a home-made bomb near an airplane or a football field is now apparent to everybody; however, little has been done to mitigate the issue. Counter-drone technology, also referred to as anti-drone, refers to systems that are used to detect and/or intercept unmanned aircrafts. These systems are also known as counter-UAS, C-UAS, or counter-UAV. Airports, critical infrastructure, and even stadiums are on the lookout for the growing threat of drones. In the past 2 years, there have been numerous incidents of drones infiltrating secure airspace. Luckily, most of these events were not due to terrorist attacks, but rather small drones flying in the vicinity of airplanes, bases, or large public spaces. However, recent incidents, such as, reports by the FBI that organized crime groups are using drones for their operations and Saudi security forces shooting down a drone near a palace belonging to King Salman, are only two examples indicating that crime and terror groups are starting to use drones as weapons. The existing solution for these kind of threat is typically the use of anti-air missiles, but wasting an expensive missile on an inexpensive drone is not scalable and poses a threat to the nearby area, so alternative counter-measures are being tested. These new systems must be cheap, easy to build, and easy to learn how to use. Manufactures are working on 1st and 2nd generation drone defense solutions and products and it still remains to be seen which solution will become mainstream. Anti-drone systems rely on a variety of techniques and technologies for detecting, tracking and/or intercepting drones. The systems can be ground-based, hand-held or UAV-based. Each platform has technological capabilities to either track & detect or intercept (countermeasure) a drone or have both options. Furthermore, each platform can be based on a different kind of technology to perform the task in hand, for example, radar, RF, IR, etc. 2019 is expected to be a year of significant growth in the anti-drone market, as multiple RFPs are being issued around the world for systems that can deal with this type of threat. There are over 150 manufactures offering over 200 C-UAV products and systems. Prominent companies leading innovation in this market are Aaronia AG, Black Sage Technologies, Blighter, Cerbair, Drone Detection Sys, Drone Shield, Gryphon Sensors, Hensoldt (former Airbus EBS), Kelvin Hughes, Lokmas, Rafael, Leonardo, SRC, TeleRadio, Artsys360, Dedrone, Department 13, Elbit Systems, My Defence, Rhode & Schwartz, Sensofusion, Skysafe, WhiteFox, Acipiter, Advanced Radar Technologies, Aveillant, DeTect, Magos Systems, MyDefence, Robin Radar Systems, Thales, Battelle, Radio Hill, SteelRock UAV, Zala Aero Group, OpenWorks, arbe Robotics, Aerotenna and others. 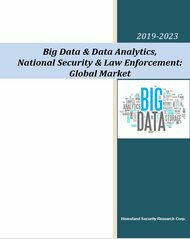 The “Counter-Drone Market & Technologies – 2019-2023” report examines each dollar spent in the market via 5 orthogonal money trails: regional markets, national markets, vertical markets, sub-markets and by solutions market. What will the Counter-Drone market size be in 2019-2023? Which countries are expected to invest in Counter-Drone solutions and services? What are the Counter-Drone market drivers and inhibitors? Why Buy this Counter-Drone Market Report? The use of counter-drone technologies can also be implemented in safe-city projects. 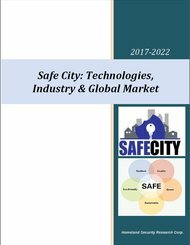 For further information regarding the safe-city market see our “Safe City Market, Technologies & Industry 2017-2022” report.